The regional airline pilot shortage continues to make investors nervous. What: Shares of No. 1 regional airline operator SkyWest (NASDAQ:SKYW) plummeted 23% during January, according to S&P Capital IQ data. The growing U.S. pilot shortage continues to cast a pall over the entire regional airline industry. Indeed, SkyWest's January performance doesn't look so bad when you consider that shares of No. 2 regional airline Republic Airways (NASDAQOTH:RJETQ) lost more than half of their value in the first three weeks of 2016. 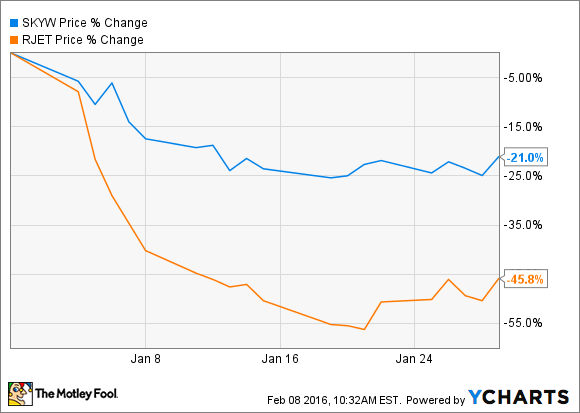 SkyWest vs. Republic Airways January Performance. Data by YCharts. So what: Regional airlines are in a bind due to a combination of tighter pilot training regulations imposed a few years ago and a rising tide of mandatory pilot retirements. Regional airlines pay less than mainline carriers, and so many of them have been unable to find and train enough highly qualified pilots to keep up with rising attrition rates. Republic Airways' profitability collapsed during 2015 as a labor dispute worsened its pilot staffing problems, forcing it to cut flights and lose out on incentive opportunities. Republic is now trying to restructure its contracts with mainline airlines to cover higher pilot costs. SkyWest didn't face the same staffing problems as Republic Airways last year. In fact, earnings soared in 2015 as SkyWest recovered from a very challenging 2014. However, SkyWest's management noted last fall that nobody in the regional airline industry is immune from the pilot shortage. Now what: Counterintuitively, SkyWest's large fleet of older, marginally profitable 50-seat jets gives it a big advantage over rivals. SkyWest is steadily shrinking its 50-seat jet fleet, freeing up pilot labor for more profitable dual-class aircraft with 65-76 seats. SkyWest is shrinking its fleet of 50-seat jets. Image source: The Motley Fool. As one of the few regional airlines with the ability to take new contracts, SkyWest has benefited from Republic Airways' attempts to slash its flying commitments. Just last quarter, SkyWest picked up a contract to operate seven E175s that had originally gone to Republic. SkyWest will continue to profit from its unique position in the regional airline industry for the next few years. This may allow it to squeeze out enough profit in the next few years to drive a rebound in the stock price. However, Skywest's long-term future is murky. Sooner or later, it could confront the same pilot staffing problems as Republic Airways and other peers, driving a similar downturn in profitability.